So, last night I set out to work some culinary magic with some items in my refrigerator and my freezer. 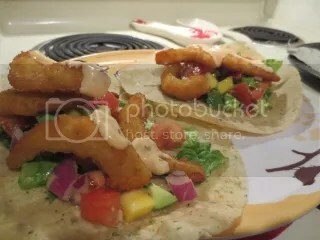 What came out of the plethora of ingredients I had on hand was one of the most amazing taco dinners I have ever created. I made mine gluten-free and vegan to fit my dietary needs, but if you happen to like real shrimp…use it. If you can eat regular sour cream…use it. The great thing about recipes is…they are made to be modified. By popular demand, here is the recipe for my Gluten-Free and Vegan Shrimp Tacos with a Mango Salsa and Sriracha Sour Cream. In a medium bowl, combine the mango, avocado, tomatoes, serrano, cilantro, and garlic. To blend the flavors, refrigerate for about 30 minutes before serving. Note: You will have left-overs…so enjoy with some gluten-free corn tortilla chips or save for the next day. Preheat the oven and cook the shrimp according to the instructions on the box. If using Sophie’s Kitchen Gluten-Free Breaded Vegan Shrimp, it takes about 10-15 minutes. Mix together the vegan sour cream (or real sour cream, if using) with the Sriracha to make the Sriracha sour cream. Warm the Rudi’s Gluten-Free Fiesta Tortillas in the microwave for about 20 seconds. Remove and place on plates. Placed chopped lettuce on each of the tortillas. Scoop about 1/4 cup of the Avocado, Tomato and Mango Salsa over the lettuce. Top the salsa with the cooked shrimp. Top each taco with the Sriracha Sour Cream. Fold tortillas around filling and ENJOY! I’m already considering making this again tonight, because I still have a good chunk of the salsa remaining and…it was really, really, REALLY good. The combination of the sweet salsa with the savory vegan shrimp (don’t mock…they are awesome) and the hint of heat from the vegan Sriracha sour cream all just worked together. My roommate (who doesn’t have to do gluten-free or vegan…in fact…loves real shrimp) fell in love with this dinner and said it was one of the best dinners I ever made. 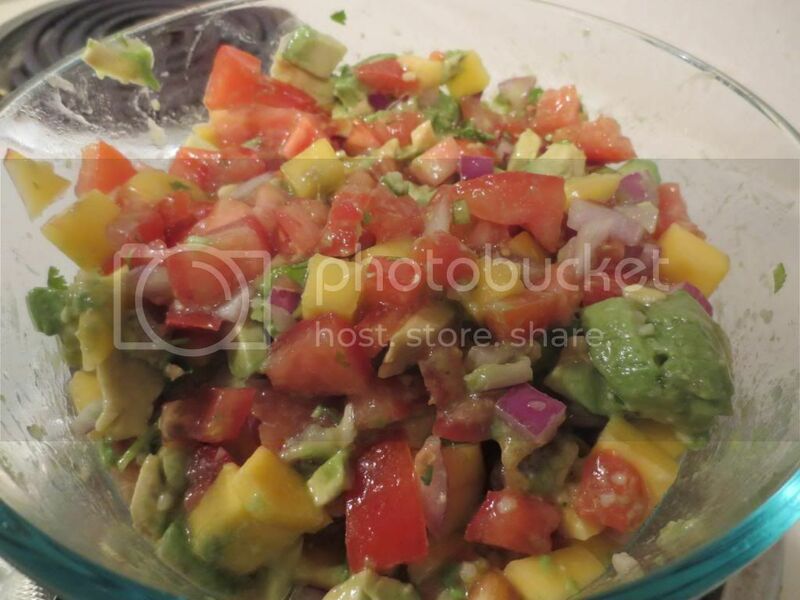 This entry was posted in Dips, Entree, Food, Frozen, Fruit, Gluten-Free, Mexican, Recipe, Salsa, Sauce, Vegan, Vegetables, Vegetarian by The Celiathlete. Bookmark the permalink.